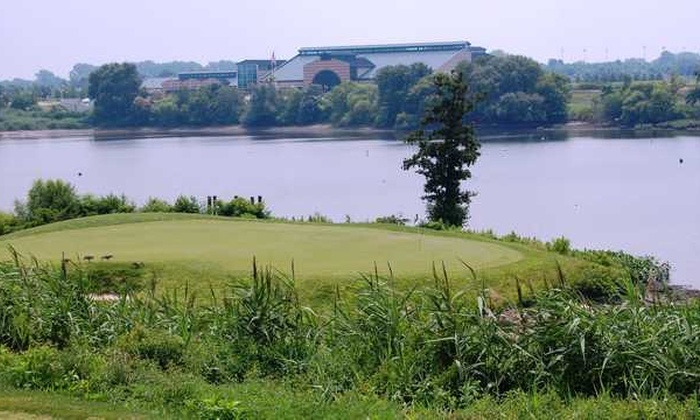 RiverWinds provides a challenge for the best player, but with four sets of tees, it can be enjoyed by golfers of all levels. At the start, the mounded terrain is gentle, but becomes gradually more imposing as play progresses. The holes vary in direction, requiring players to use every club in their bags to battle the crosswinds and the tricky terrain. Other natural landforms, indigenous foliage and sod-walled bunkers add to the excitement of the golf experience at RiverWinds. This promotion is made available through GolfNow. Groupon is not affiliated with or sponsored by RiverWinds Golf Course in connection with this offer. Voucher valid only for date and time listed; may not be exchanged or redeemed for other dates/times. Non-refundable and non-cancelable unless the course is closed due to weather. For Hot Deals, full payment is due at time of purchase on Groupon (no additional fees). For tee time bookings, booking fees are due via Groupon and green fees are due at course; customer is responsible for payment of green fees unless the course is closed due to weather. Offer not eligible for Groupon promo codes. Groupon Terms of Sale and Extraordinary Event Policy do not apply. Purchaser name provided at checkout will be shared with GolfNow and RiverWinds Golf Course to fulfill order.